Before we sketch a single idea, we start our projects by asking questions. In architecture speak, this is called programming. 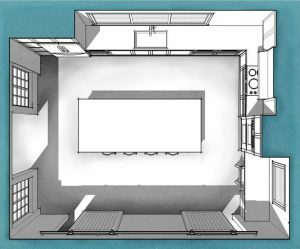 Whether you work with a professional or do-it-yourself, answering these questions before you begin will put you on the road to kitchen design success. ✚ Will you have an oven with a range? Or do you want a separate cook top? Do you want gas, electric, induction? ✚ Do you want a range hood? Will the microwave provide ventilation over the stove? Or do you want a downdraft stove? ✚ Wall ovens? How many? ✚ Standard dish washer or dish drawers? ✚ Built-in microwave or microwave drawer? ✚ How many sinks and what type of faucets? 3. Do you want an eat-in area or breakfast table? 4. Do you want a separate pantry closet? Or will a pantry cabinet suit your needs? 5. Will you have a bar area? Should you plan for wine and liquor storage or display space for glassware? 6. Do you need space for a cookbook collection? 7. You’ll need to choose materials and finishes for your counter top, flooring, and backsplash. Choose wall and trim paint colors. 8. How many outlets do you want and where should you locate them? Plan the arrangement of your counter top appliances. 9. Do you have live plants, herbs, or a kitchen garden? 10. Do you need compost storage? If you don’t have an outdoor compost, consider a self-contained system that can fit inside a cabinet. 11. Do you need a memo board? How big and where should it go? 12. Does your kitchen host other uses such as a home office? 13. Will you have a television in the kitchen? Where will it be located? It includes this full kitchen list as well as questions for living spaces, dining rooms, bedrooms, bathrooms, closets & storage, garages & utility rooms, and outdoor living spaces. Print the sections you need and fill them out for a solid start to your project.